The traditional territory of the Algonquin people has always included the Ottawa Valley and adjacent lands, straddling the border between what is now Quebec and Ontario. Unlike most of Ontario and the Prairies, Algonquin territory has never been dealt with by a land-sharing Treaty. Algonquin title continues to exist. The orange line shows portions of the boundary covered by the Royal Proclamation of 1763, issued by King George III following the end of the Seven Years War. The Proclamation contains important provisions regarding First Nations’ rights to their traditional territories. With the arrival of the Europeans, the ancestors of today’s Algonquins were already well-established in the Ottawa Valley. Initially, the people who now identify as Algonquins were known by a variety of names. The Jesuit priest Pierre François Xavier de Charlevoix, in his 1744 Journal of a Voyage to North America, mentions the Algonquins, Nipissings, Timiskamings, Têtes-de-Boules, and Gens des Terres. 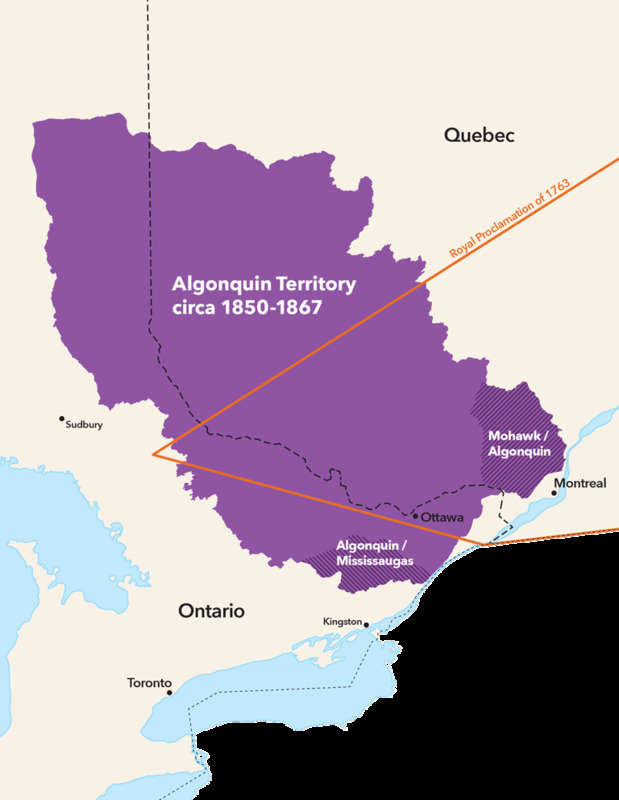 By the end of the nineteenth century, “Algonquin” had become regularized to refer to those peoples occupying the Ottawa River watershed whose neighbours were the Mohawks (to the east), the Atikamekw and Cree (to the northeast and the north), and the Anishinaabe (to the west and the south). At present there are ten recognized Algonquin First Nations with a total population of around eleven thousand. Nine of these communities are in Quebec: Kitigan Zibi, Barriere Lake, Kitcisakik, Lac Simon, Abitibiwinni, Long Point, Timiskaming, Kebaowek, and Wolf Lake. Pikwakanagan is in Ontario. Three other First Nations in Ontario are at least partly of Algonquin descent, connected by kinship: Temagami, Wahgoshig, and Matachewan. Before the coming of the railways, water routes were the primary communication and transportation corridors. The Ottawa River was the highway that connected the St. Lawrence to the Upper Great Lakes and the northern interior. As Gilles Havard documents in The Great Peace of Montreal of 1701: French-Native Diplomacy in the Seventeenth Century, the French benefitted commercially and militarily from the access to the upper country that their alliance with the Algonquins and Nipissings guaranteed. But, as can be seen from surviving Hudson’s Bay Company account books (for instance, the books from Fort Albany in 1695), the Algonquins also traded with the English at James Bay, depending on where they could get the best deals. Partly in acknowledgement of the balance of power, and partly from expediency, both the English and the French employed First Nation practices and protocols in their political, trade, and military relations with the Algonquins and other nations, including the use of presents, the exchange of wampum, and Treaty making. 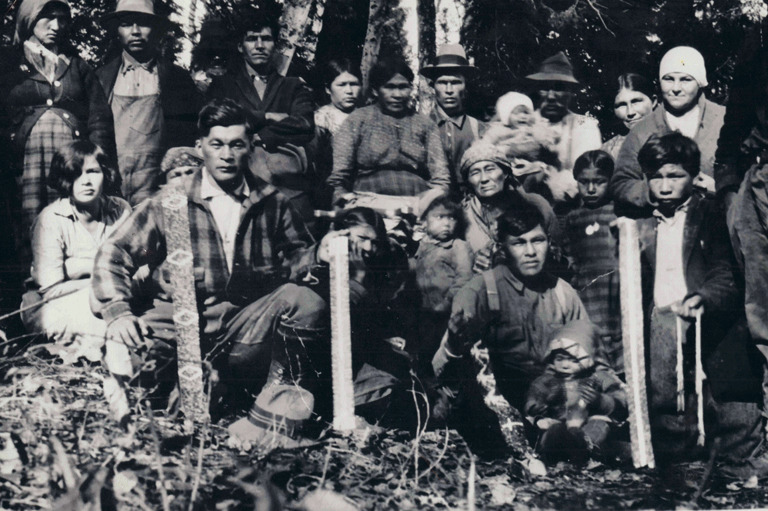 Members of the Algonquin community hold a number of wampum belts, some of which memorialize early relations with the French and the English, near Barriere Lake, Quebec, circa 1926. At this point in the Seven Years War, when the French- English competition for control of northern North America entered its final phase, the British worked hard to obtain the neutrality, if not the outright alliance, of the First Nations allies of the French. These included the Algonquins, not least because they controlled the water routes that provided access to Montreal and Quebec. According to the First Nations parties, the Treaty of Swegatchy included the guarantee that the British “would secure to us the quiet & peaceable Possession of the Lands we lived upon.” For the British, this Treaty opened the road to Montreal. The British also entered into a Treaty directly with the First Nations at Kahnawake on September 15 to 16, 1760, which confirmed the terms of the peace. In the following months, British officials regularly assured the former allies of the French that their land rights would not be prejudiced. Unfortunately, in many cases these promises were not kept, leading to continued friction, including an inter-tribal uprising against the English, led by Pontiac, an Odawa war chief. King George III’s Royal Proclamation of 1763 was partly intended to provide additional assurances to First Nations that “frauds and abuses” and land grabbing by settlers would be stopped. It recognized the pre-existing land rights of the First Nations and established principles for a formal Treaty-making process, whereby First Nations lands could only be taken up by way of consent and fair compensation. 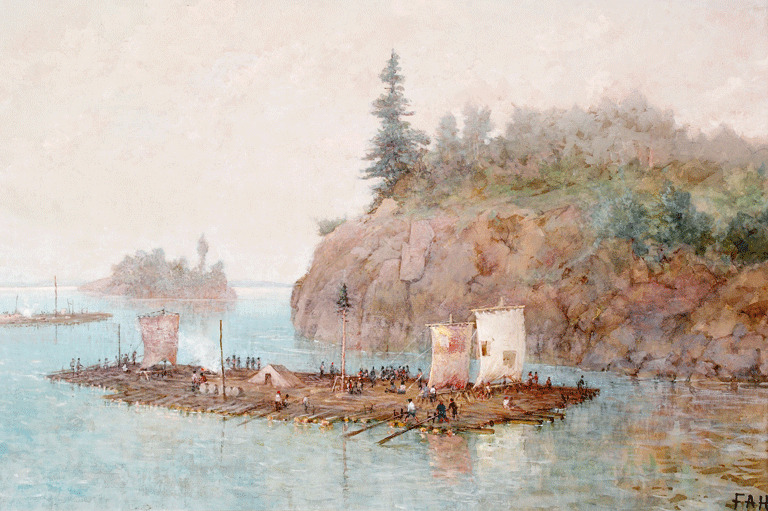 The Timber Raft, by Frances Anne Hopkins, 1868, depicts lumber being floated downriver to Quebec for processing. The nineteenth century saw an influx of non-Indigenous loggers who began cutting operations on traditional Algonquin territory. The Algonquins were a part of these events. They were at the Treaties of Swegatchy and Kahnawake and received copies of the Royal Proclamation. There are also wampum belts held by the Algonquins that come from this period and that record these events and the commitments made therein. These belts were presented to the prime minister and premiers of Canada during the March 1987 first minister’s conference in Ottawa. Between 1766 and 1861 a series of royal instructions, ordinances, and new laws confirmed and reflected the assurances that had been made by the British with respect to the protection of First Nations lands, including protections against trespass. However, for a variety of reasons, the assurances regarding the protection of First Nations lands and the need to enter into Treaty before settlement — assurances the British provided from 1760 onward — were not applied to the Algonquins or their territory. Pressure for land increased in the period following the end of the American Revolution in 1783, when British Loyalists came north to Canada and had to be resettled. The Algonquins became alarmed and began to petition government, requesting that their lands be protected and that if settlement was to occur Treaties should be made. The Parliament Buildings, which overlook the Ottawa River, are located on traditional Algonquin territory. The Algonquin land claim covers a territory of thirty-six thousand square kilometres in eastern Ontario — a region populated by more than 1.2 million people. This was followed by a long series of petitions and requests to various imperial and local government officials in the following decades. One of the Algonquin petitions, from the fall of 1824, was given to Sir John Johnson, superintendent general of Indian Affairs and the son of Sir William Johnson. Their alarm only increased as the lumber industry moved up the Ottawa River and its tributaries in the first decades of the nineteenth century. Today, 258 years after the Treaties of Swegatchy and Kahnawake, and 255 years after the Royal Proclamation of 1763, Algonquin Indigenous title — including to Ottawa, the nation’s capital — remains an outstanding issue. Despite their protests, no land Treaties were made directly with the Algonquins and they never received any compensation for their lands. The timber was too valuable and the imperial government was not prepared to struggle against powerful settler interests at a time when it was looking to off-load its responsibilities and have the colonies pay their own way. At the time of Confederation, the government of Quebec simply refused to consider the notion of Treaty, and for its part the government of Ontario was hostile to any recognition of Algonquin interests on the south side of the Ottawa River. This hostility even extended to the setting aside of reserve lands for the Algonquins. The people at Golden Lake (Pikwakanagan) were forced to purchase their own lands in 1873. Lands were reluctantly set aside by Quebec at River Desert and Timiskaming in 1851 and at Lac Simon and Rapid Lake in 1961–62. The Algonquins of Abitibiwinni used their own funds to purchase their reserve at Amos in 1956; and Canada purchased a small reserve for Kebaowek in 1974. So today, 258 years after the Treaties of Swegatchy and Kahnawake, and 255 years after the Royal Proclamation of 1763, Algonquin Indigenous title — including to Ottawa, the nation’s capital — remains an outstanding issue. This article focuses on the portion of Algonquin territory south of the height of land, dividing the waters that flow north into James Bay from those flowing south into the Great Lakes. In 1906-08, the Algonquins of Wahgoshig and Abitibiwinni, north of the height of land, did become associated with Treaty No. 9, but the impact of this event on the Quebec portion of their territories, and on the area to the south, is uncertain. That is a story for another day. Peter Di Gangi is the Director of Policy and Research for the Algonquin Nation Secretariat in Timiskaming, Quebec. An expert on Indigenous historical, legal and cultural research, Di Gangi has also worked extensively with Anishinaabe communities on the North Shore of Lake Huron and Manitoulin Island, and with the Algonquin communities of the Ottawa Valley.